In May 15th, 2016, the Guardian newspaper and ABC network reported the news of a rare beaked whale. The news made mention of the unusual teeth structure of these whales and claimed -without providing any scientific proof- that these findings are the supposed remnants of the evolutionary process. According to the news, which also featured the claims of the South Australia Museum personnel, the said whale had supposedly vestigial teeth. This assertion brings to mind the repeatedly refuted ‘vestigial organs’ claims proposed by evolutionists. Evolutionists argue that some organs lose their functions over time and thus some creatures possess redundant organs; in other words, organs they do not use. However, today everyone knows very well that the organs declared vestigial by evolutionist are in fact quite vital and complex. Yet the vestigial organ tale, which has been repeatedly retold in many different forms by Darwinists, is still kept on the agenda as a byproduct of the lack of knowledge and most of all, the aim to deceive the public. The issue of beaked whales is another example of this lack of knowledge and the desperate attempts to come up with evidence for the theory of evolution. 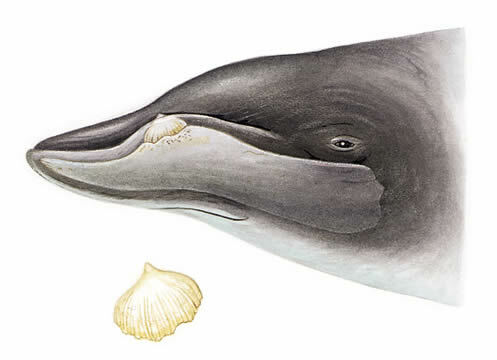 When the researchers examined the jaw structure of the said beaked whale, underneath a tooth, they found another larger tooth they had never seen before; they claimed the tooth they had found to be ” possible evidence for evolution rather than a deformity.” Acting merely on presumptions and lacking any scientific ground, these scientists are disregarding the following crucial facts: Firstly, there are tens of discovered whale species. Some of these species have two large teeth, while some have four. Moreover, there are also those who possess rows of teeth among these species. This kind of changes stem from not the evolutionary process, but from genetic diversity among species. When the fossil of another rare marine life form, the Coleacanth, was discovered, similar hypotheses were put forward. The Coleacanth was claimed to be the lost link in the tale of migration from water to land, and it received a great deal of coverage in the press. However, the discovery of this creature by fishermen in open seas, which was previously believed to be extinct and thus conveniently became the subject of many evolutionary tales, caused a good deal of disappointment among the evolutionists. Consequently, with all its organs and anatomy, the Coleacanth turned out to be a fully developed deep-sea fish. Broadening scientific knowledge and new discoveries further demonstrate God’s art of creation. In spite of this fact, Darwinists insistently resorting to deception and distortion methods is quite baffling. Of course, beaked whales’ deep dives, their diver-like ability to protect themselves against depth intoxication, and the exclusive system of their lungs cannot be explained with these words of Darwin; “I can see no difficulty in a race of bears being rendered, by natural selection, more and more aquatic in their structure and habits, with larger and larger mouths till a creature was produced as monstrous as a whale.” (Loren Eiseley, The Immense Journey, Vintage Books, 1958, p. 186) This statement of Darwin, whihc has nothing to do with scientific facts, is actually a summary of the evolution theory. Tyack, Peter L., et al. “Extreme diving of beaked whales.” Journal of Experimental Biology 209.21 (2006): 4238-4253.